I came across this book on the list of top young adult books in 2015 on seventeen.com: http://www.seventeen.com/celebrity/g1333/best-ya-novels-coming-out-2015/. This book was very well written but I felt that it was a bit redundant at times. Moreover, the descriptors in this book weren’t very accurate and a lot was left up to one’s imagination. However, the author did clarify a few things later in the book, which oddly made things more confusing. Overall, this book was captivating and I enjoyed it immensely. Grace isn’t sure what’s real and what’s not. She saw her mother get murdered, but the police say it was an accident. She saw the man who did it, but the doctors say he was a figment of her imagination. She knows she’s not crazy, but everyone else knows she is. After Grace’s brother joins the military, Grace is forced to move back to her childhood home, where painful memories await her. 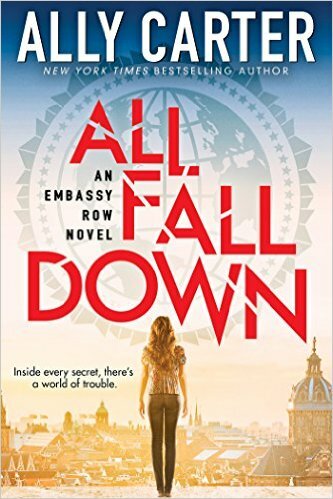 The Embassy Row is a new, yet old place for her. So much has changed, yet the people are the same. Grace is reunited with her old friends, but also makes many new ones. Grace lives in the United States embassy with her grandfather. The embassy brings back many painful memories, and Grace’s medications are started up again, as she has started reliving her past. When Grace sees the man who murdered her mother,she is scared out of her wits. Grace believes she is next. However, her grandfather and friends do not believe her because it is the fifth time she has accused a man of being the person who murdered her mother.